I use Git extensively in both my personal and professional work. I've set up GitLab for my personal work. I know enough about Git to be effective in a small environment with a handful of developers. 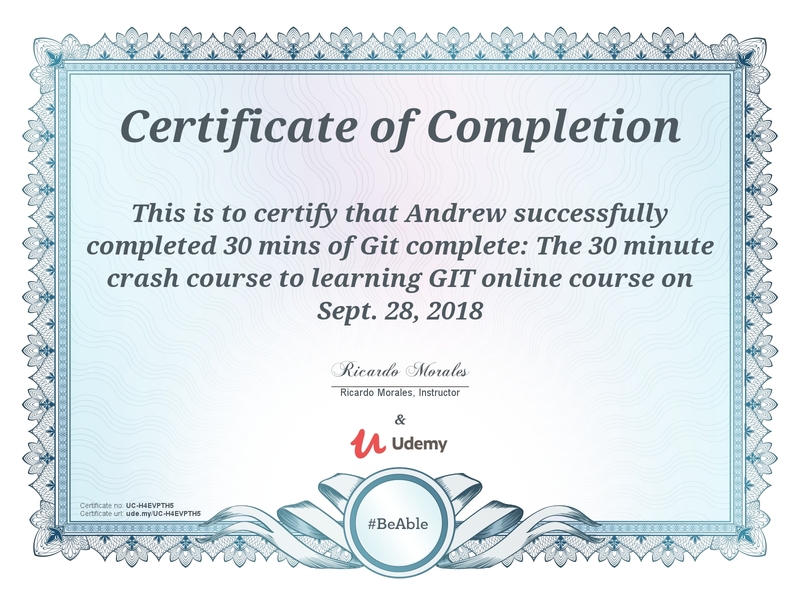 I found a 30 minute crash course about Git on Udemy and decided to take it with the goal of learning a little bit more. The course I found was The 30 minute crash course to learning GIT2 by Ricardo Morales. Spoiler: I rated this course poorly on Udemy and since that rating, the course name has been changed to "The 2018 Git Complete: 45 minute Crash Course using Angular". The course has been updated slightly to add 15 more minutes of content since I completed the course. I have watched those as well and have not changed my rating. When I took this course it was definitely incomplete. The very first lesson starts with "In our previous lecture...". Obviously, as the first lecture, there isn't a previous one. The 15 minutes of new content does add a few introduction lectures before this, so it's not as jarring, but the order of lectures is still out of order. There are next instances of "In the next lecture I'll cover..." and then the next lecture is something else, or "In the last lecture we talked about..." and the mentioned topic was a few lectures ago. The course is a very quick run down of common Git commands. Very quick. Most lessons are under a minute in length. What this means is that there is almost no explanation about the command you're about to learn. In most of the lectures, it's a quick reading of the command's "help" sentence, then typing the command in a terminal window to show the syntax. Unfortunately, there isn't an over all project and the order of the lectures is out of order, so it's difficult to see how a particular command actually works since there isn't any set up done ahead of time. One example of how this is poorly demonstrated is in the lecture on renaming a file. The example uses mv to rename a file, talks about how it's been renamed, and then uses mv to rename it back to the original name to that there "won't be problems with Git." The entire point of the lecture is to show how this should be accomplished and this lecture misses it's mark entirely. Another example is in the lessons on handling merge conflicts. This is an important topic because conflicts need to be handled when multiple developers are working on the same thing. The lecture on handling these though talks about the theory of handling it but doesn't provide a demo. The same thing is done in the topic on rebasing. Minute long lectures are not a good format. The lessons are rushed to the point where there is almost no content. Reading the "help" sentence and then showing the syntax doesn't make this a crash course. It makes it an audio/visual help document. If you know anything about Git, avoid this course. If you don't know anything about Git, I'd avoid it too, unless you prefer listening to help documents instead of reading them. There isn't any novel content here. Examples are lacking, at best. Lectures are out of order and when I took it, missing entirely. The newly renamed course to include "using Angular" is incredibly misleading. Angular is used only to generate a project that can be committed to Git. Nothing done here uses Angular other than generating that project. If you know anything about Git, there is nothing here you don't know. The completion award below reflects the name of the course before it was renamed.